Three-year old Caiden Hawtree lives in Colfax, North Carolina, and there is just something about this little boy that seems to touch people, even as far as Colorado. When he was born, right away doctors knew something wasn’t right. His parents and two big brothers soon learned Caiden is in a constant fight for his life because he not only has cystic fibrosis, he has a life-threatening heart condition and he’s had three open-heart surgeries, his most recent one on September 8. Caiden is still in the hospital and all his parents can do is pray and ask for your prayers. 10News' sister station 7NEWS first told you about Caiden earlier this summer after Anne Trujillo talked to him and his parents via Skype about his constant health struggles. His dad Daniel is a Baptist Minister. His mom Julie works at home raising Caiden and his two brothers. The two feel so helpless and desperate to do anything they can for their little boy. And that is where Chris Kuemerle of Brighton, Colorado comes in. He found out about Caiden and was truly touched by him. Chris’ hobby is making unique kid beds; Caiden saw a tractor bed online and wanted one, so Chris went to work, spending three months of his nights and weekends making a bed just for Caiden. He raised the money himself, built it in his spare time while not working his job at Costco, and had the full backing of his wife and kids. In fact, he and his wife decided they would drive it out to North Carolina themselves. So on a hot August day, there was a party at the Hawtree house and Caiden was the guest of honor, but he didn’t know it. Caiden, in his grandfather’s arms, asks him, “Why everybody here?” He sees the crowds gathering in his yard, the balloons, even T-shirts with his name on it and he knows something is up. Little did he know Chris had made the drive to North Carolina and was parked in rental truck down the street. 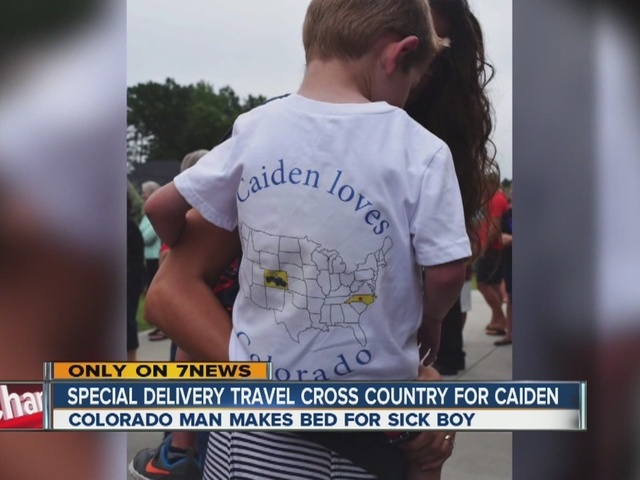 He was sitting in the driver’s seat, watching all the commotion for a little boy, and knowing the crowd was waiting for him and the big blue tractor bed safely packed away inside his big yellow rental truck, with a sign on the side that reads “Colorado Loves Caiden.” Chris is emotional. He tells our photographer he is trying to hold back the tears because he knows the moment has finally arrived. Now, the wheels are in motion and Chris pulls the truck into Caiden’s driveway, and Caiden knows something big is about to happen. The trucks stops, Chris jumps out and opens the back and out comes a collection of colorful balloons. Caiden, in his mom’s arms, taking it all in with a big smile on his face watching the balloons disappear into the sky. And then Chris walks up to the little wide-eyed boy, and you can hear his voice quivering as he says, “You know what I did? I made you a tractor bed. You want to see it?” Caiden nods his head yes and off they go. Caiden doesn’t say much, but you can see on his face, that this is the bed he’s been wanting and now it’s finally here. In a soft voice he says “thank you” and Chris responds with a “You are welcome, buddy,” and then the two hug. Two complete strangers, now forever bonded by a bed. Two more updates for you: Chris is starting his own nonprofit called Little Warriors’ Dreams. He plans to work with local hospitals to build beds for other sick children. Caiden is in the hospital now. He is struggling to recover from recent surgery. He is battling a blood clot and fluid in his lungs. His mom isn’t sure when he will be able to go home, but she assures us he tells all the doctors and nurses about his big boy tractor bed.